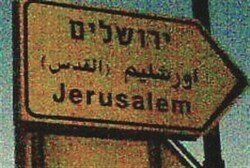 How do you say ‘Jerusalem’ in Arabic ? Have they been paying attention at all ? The Subcommittee For The Authorization Of Place Names Of The Knesset Names Committee. The subcommittee has been meeting for several months, discussing reform in Israeli highway signage. The subcommittee has discussed various protocols for proper spelling in Hebrew and English. This entry was posted on Thursday, December 15th, 2011 at 08:03 and is filed under Main Postings. You can follow any responses to this entry through the RSS 2.0 feed. You can leave a response, or trackback from your own site.